Coaching has been around for as long as we’ve been social animals. Today, coaches often use the terms Life Coach and Executive Coach to refer to coaches who work more in the area of people’s lives or business people’s lives. My session really opened my eyes…the experience is one that has left me with a profound openness and release that I want to feel every day. Something I think we all want in our lives. What is most important to you right now? How does your time and attention today reflect that? Here are some other sample coaching questions that you could expect in our sesssions. Feel free to respond to any of these questions as well! Who are you if you're not afraid? What are the things you do in your business that someone else can do? What do you want more of in your life? Clicking “Let’s Get Started!” will send your response directly to Project Wholeness, and we’ll contact you about scheduling a Complimentary Coaching Consultation. Coaching tends to fall on a spectrum from authoritarian to empowering.While I have used a coaching skills from a large portion of this spectrum at one time or another, I prefer to be at the empowering end of the spectrum, creating space for possibility and awareness, and asking the hard questions no one else asks. Although this sounds simple, it is anything but. Finding the question that cracks something open is my specialty. And seeing the transformation that happens when someone breaks through a roadblock that was keeping them from accomplishing what they needed to do is so exciting! The biggest change in my life is that I don’t agonize over setting boundaries. I can say, “No, that doesn’t work for me.” I am listening to my intuition and making choices that honor what is best for me. What is the most badass thing you could do in your current situation? Originally from California, I’ve lived in 9 states from Cali to Rhode Island, Texas to North Dakota and quite a few in between. I spent the mid-90’s doing startups with a telemarketing company as a trainer and consultant, and then went back to school. With undergrad and graduate degrees in teaching fields, it began to become obvious to me that the thing I enjoy the most is facilitating learning in ever-changing contexts. Having started a couple businesses, consulted with small and medium sized businesses, non-profits, churches and schools, I have worked with a large variety of folks in quite a few settings, and become adept at helping people adapt to changing markets and passions. Trained as an Interim Minister and New Church Start Minister, my tendency to excel in contexts littered with change and new opportunities emerged again as a strength. As a minister, I worked with congregations during times of upheaval, walking with folks while they faced life and death and the questions that help us make meaning out of it all. After leaving church work, I came out as an atheist and bisexual, and heeded suggestions from several friends to explore coaching. This new career allowed me to do exercise my curiousity superpower and still be present for my family. The queerest thing in my daily life is the fact that I’m a homemaker. Homemaking is a constant act of gender non-conformity for myself and many others (especially men). Becoming more authentic led to experiments like the 30 Days in a Skirt project (I still wear skirts almost every day), and work writing about ending systems of privilege for what I call the Great White Male. 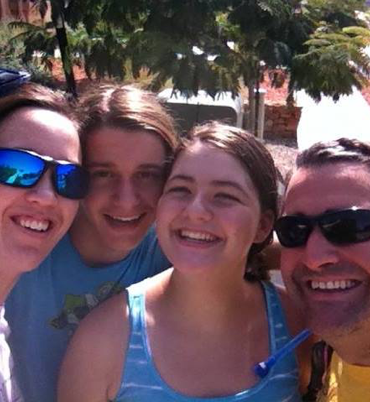 My very full personal life begins with raising two fabulous teenagers with my amazing spouse. I am an avid athlete, rock climber, and gamer. If I’m not on some outdoor adventure with my geocaching spouse, I’m likely adventuring with the latest xbox game, in Tyria, or Neverwinter with my friends in Albuquerque. “Royce, I want to thank you for your help during a very important time in my life. Your presence during my transition into launching my own full-on career as an entrepreneur after my divorce was instrumental. I was going into this new venture somewhat blindly from a business stand point. Having you at my side, asking all the right questions was hugely informative. It’s been a few years now and I’ve gone from doing house calls and seeing clients in my living room to having a brick and mortar at a busy downtown location. We remodeled last year, doubling in size and are looking again for more ways to expand! Grateful for your help in laying the foundation.